In 2006, guitarist Paul Gilbert released his first all-instrumental album - Get Out Of My Yard. For many of the shred pioneer's fans, this was the album they had been waiting for for years. Get Out Of My Yard was a fantastic, well-received recording that proved Gilbert could hang in there, both as player and a writer, with the biggest names on the instrumental rock guitar scene (Satriani, Vai, etc). But would he (could he) do it again? Had Gilbert genuinely been bitten by the instrumental bug, or would Get Out Of My System been a better title for his first all-instrumental effort. Gilbert's new album, Silence Followed by a Deafening Roar (released in the US through Shrapnel Records), answers that question definitively - not only does he have plenty left in the tank as a writer and producer of instrumental rock, he's getting better at it. Comparing Silence to Get Out Of My Yard is admittedly unfair, but ultimately inevitable. Any album should be allowed to stand on it’s own feet, and be judged on it’s own merits. 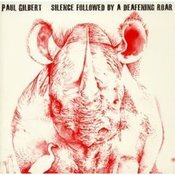 That said, being that they are both instrumental recordings (the only two Gilbert has ever done), it’s hard not to view Silence as a "follow-up" to Get Out Of My Yard. But fear not - while there are certainly a few songs on the new album that sound like they were cut from the Get Out Of My Yard cloth, Silence is a very fresh-sounding record; it doesn’t come off like Get Out Of My Yard: Part Deux. One notable difference between the two discs is the highly textured production of the new album. The palette of guitar tones and effects on Silence, as evidenced by tracks like "Bronx 1971" and "Paul Vs. Godzilla," is broader than it was with Get Out Of My Yard. This gives the new disc a deeper, more polished sound than it's predecessor. Great tones aside, the key component that separates an engaging instrumental rock album from a boring one is the writing. An instrumental album of any kind may be packed with great playing, but it will only hold your interest for so long if the songs themselves are dull. This is why Silence is a stand-out album in it's genre. Sure, there is a lot of great guitar playing here, but isn't that always the case with a Paul Gilbert album? The mature writing and slick production are what really make Silence an enjoyable record, not just the abundant shredding. In general, the melodies found throughout this record are very catchy and tuneful. In fact, some tracks, such as “Norwegian Cowbell” and "Eudaimonia Overture, " have an almost sitcom theme-like quality at times. Even the very fast stuff is often melodic in it's application, such as the soon-to-be-signature tapping part in the album's title track. Not surprisingly, there's some heavy stuff on the album as well. For example, Gilbert ventures into old school Shrapnel-shred territory on “The Gargoyle.” Clearly the most "metal" tune on the album, this track is loaded with fast, harmonized runs and riffs, and will surely remind many of the Racer X song "Technical Difficulties." "The Rhino" is another heavy Silence track where harmonies are used to great effect. Gilbert has recorded many adaptations of classical pieces in the past, but what he does here with Ernest Bloch's "Suite Modal" is quite different from anything he has tackled before. This subtle, highly melodic guitar/piano duet completely lacks the "perpetual-motion" vibe that some of Gilbert's previous classical arrangements have had. This piece really drives home the notion that melody is king on this album. Furthering that point, there are a couple of nice ballads on Silence as well; a Gilbert original entitled "I Cannot Tell a Lie," and a great instrumental version of the Elvis Costello/Burt Bacharach song "I Still Have That Other Girl." The song where it all comes together, however, is "Bultca Saturno." This Pat Travers-like funky track can be viewed as a microcosm of the whole album - the melodies fit perfectly with the dynamic grooves, the fast stuff is very well-placed; in short, it's the best example of everything that is right with this record. Gilbert's supporting cast for this album is identical to Get Out of My Yard. The rhythm section of Jeff Bowders on drums and Mike Szuter on bass is rock-solid, and Emi Gilbert adds some nice B3 work to a couple of tracks and plays piano on "Suite Modale." If you are a Paul Gilbert fan, or an instrumental rock guitar fan in general, purchasing Silence Followed by a Deafening Roar is a no-brainer. But given it's melodicism and great production, this album will no doubt appeal to wider audience as well. Highly recommended. I'm looking forward to hearing this record. I've been a longtime fan of Gilbert's guitar player, but it took me a while to come around to his writing. After catching him on the last G3 tour, I got a better feel for his music. I can't wait to hear the new tracks! Great review! SFBADR is an awesome album. Can't wait to hear and see the songs live on the Satch & Gilbert UK tour. In a word brilliant. This is the most captivating shred album since Greg Howes debut. The reviewer said it, great tunes not just great playing. If only more guitar albums sounded like this. Its got Gilbert's loony personality running throughout. Great stuff. Very good album and a brilliant follow up from the "Get out of my yard" cd. Wide range of catchy guitar licks and general all round great guitarage. Paul Gilbert has developed a nice instrumental style which should appeal to any guitar mad people out there, but also to non-guitar mad listeners as well (unlike alot of vai/satch/ywngwie). Best thing is he can do this spot on live as well. The White Rhino has an immense body and large head, a short neck and broad chest. This rhino can exceed 3,500 kg (7,700 lb), have a head-and-body length of 3.5–4.6 m (11–15 ft) and a shoulder height of 1.8–2 m (5.9–6.6 ft) The record-sized White Rhinoceros was about 4,600 kg (10,000 lb).